In our Business Principles, we recognize the importance of resource revenues in contributing to sustainable development in our host countries. 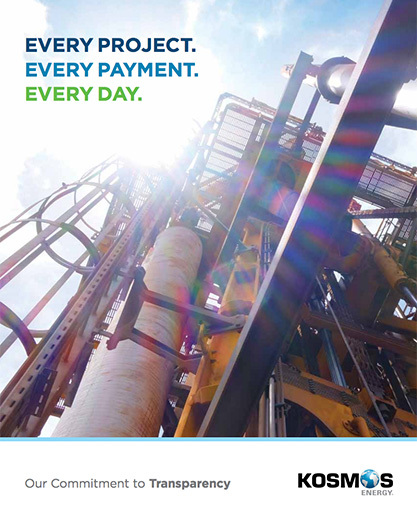 Kosmos believes resource revenues are more likely to be managed in the best interests of a country if payments and receipts are made transparently, and if accountability measures are in place for the use of revenues. Ideally, this process is underpinned by a national dialogue in which industry plays its part as a partner with government and civil society. Kosmos is committed to advocating for transparency in our dealings with host governments. 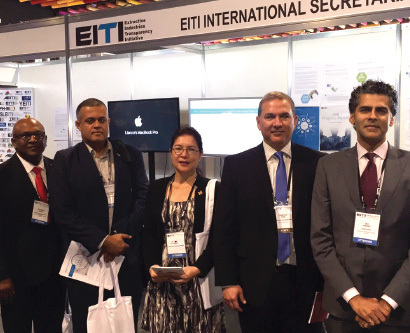 Kosmos is a Supporting Company of the Extractive Industries Transparency Initiative (EITI), a leading global standard that strengthens governance by promoting transparency and accountability in the oil, gas, and mining industries. For more information, please visit www.eiti.org/eiti. Kosmos has disclosed its payments to governments on a country-by-country and a project-level basis since 2014. We believe that this type of disclosure is beneficial to investors, civil society and local communities, and reflects evolving international expectations. Our 2017 Payments to Government report can be found here. This report was prepared in accordance with the UK’s Reports on Payments to Governments Regulations 2014 (as amended in December 2015), with some voluntary additional reporting that we believe provides helpful further detail or contextual information. 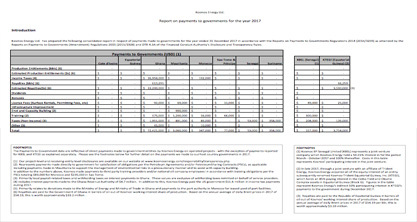 Previous years’ payments to governments data can be found here. Please note that previous years’ data tables may not be comparable, either to each other or to this year’s tables. This is because our methodology for reporting payments to governments has been refined over time, including based on consultation with civil society and end users of the data. Where it is legally possible and acceptable to our host governments, we make the material terms of our Petroleum Agreements (PAs) and Production Sharing Contracts (PSCs) publicly available. All of our PAs and PSCs have been filed with the Securities Exchange Commission and can be accessed here (via the links below). 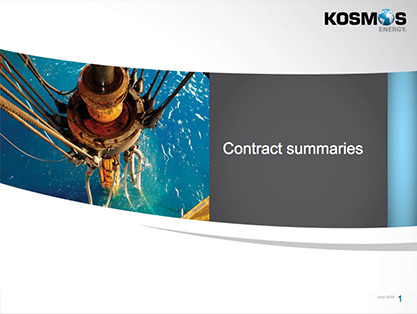 Summaries of the key provisions of our various contracts with governments can be found here. Kosmos occasionally engages in public policy discussions around energy, corporate responsibility, and transparency -- publishing statements and brochures reaffirming our belief that our approach to transparency helps us manage social and political issues, establish Kosmos as a partner of choice and mitigate barriers to growth. In October 2015, Kosmos submitted a comment letter to the United States Securities and Exchange Commission (SEC) as part of the SEC rulemaking process for Section 1504 of the Dodd-Frank Wall Street Reform and Consumer Protection Act, which proposes requiring US-listed companies to disclose payments to US and foreign governments as a standard part of their reporting to the SEC. In our comment letter to the SEC, we highlighted our commitment to transparency, including our project-level disclosure in accordance with the EU Accounting Directive. A copy of this letter is available here. We reiterated our position on these topics in a statement in February 2017, available here, and a further letter to the SEC in March 2018, available here. Read also our letter to the UK Department for Business, Energy and Industrial Strategy welcoming the UK government's efforts to enhance transparency in the oil, gas, and mining sectors, available here. Read our Transparency Brochure here. Summaries of the key provisions of our various contracts with governments can be found here. The full text of our agreements can be found following the links below.